The Company possesses a number of treasures, either bequeathed or donated. A selection are described below. Silver Gilt – 3.5 Inch circle bearing Coat of Arms of the Company. Silver gilt. Finely engraved Arms of the Broderers Company and the date 1658. Hall-mark London 1902. Maker George Fox. Engraved around the well in contemporary style:- “To the Worshipful Company of Broderers” and around the foot in applied Gothic lettering “John Mantell Citizen and Broderer gave this in the last year of the reign of our sovereign Lord King Edward VII 1909 being Master in that year.” With cover. John Mantell was Master in 1909 and 1920. Hall-mark London 1909, maker C & Co.
Engraved on one side the shield of the Mercers Company, on the other the Arms of the Broderers Company. Caudle Cup of antique design, two right ring handles. Engraved round foot:- “Presented by the Mercers Company MCMIX”. Parcel gilt-plated. The gift of Lionel W P Barber Master 1952-53. Maker Elkington 1851-1880 in c1851. 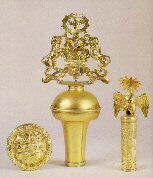 Two silver rosewater dises commissioned by the Worshipful Company of Broderers to mark the Millenium 2000, one donated by Past Master Stuart Errington Master 1997 - 1998. Designed and made by Rod Kelly, Silversmith. 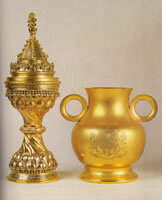 Three goblets two silver and one silver gilt), the gift of Sir Robert Bellinger (Master 1963/64). Two octagonal silver salvers, the Joint Gift of Past Masters Wilfred A. Button (Master 1956/57, 1969/70) and Sir John Donne (Master 1983/84). One of two silver condiment sets, the Gift of T. D. Wilkin (Master 1966/67). Two silver ashtrays, the Gift of Lord Auckland (Master 1967/68). Enamelled, full Broderers Company Coat of Arms in heraldic colours with motto Omnia Desuper at base. (Translation All Things Are From Above). Known as the Master’s Jewel and worn by him during his year of office. Given to the Company in 1874 by Charles J Leaf, Master 1870-71 and 1871-72. 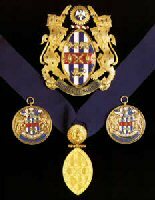 The Badge’s supporters were added in 1980, given by Anthony J Hart OBE, DSC, Master 1976-77. The Warden’s and Renter Warden’s Badges of Office, the gift of Squadron Leader Percy R. Levy (Master 1962/63).